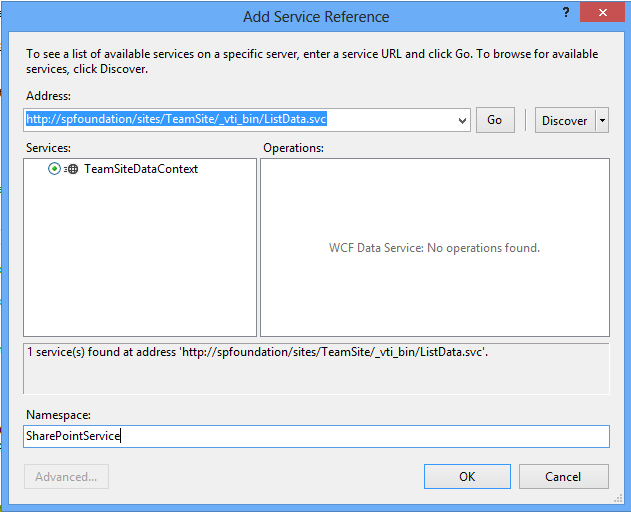 This walkthrough shows how to create a Windows 8 app that displays SharePoint Announcement, Tasks, Calendar and Documents lists information by using the ListData.svc WCF data service . 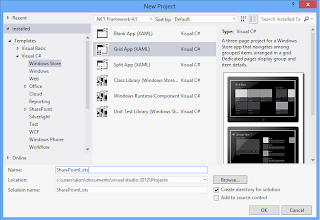 You can download the complete Visual Studio project for this tutorial from CodePlex. Download the source code. You can also view the source code on the this page. 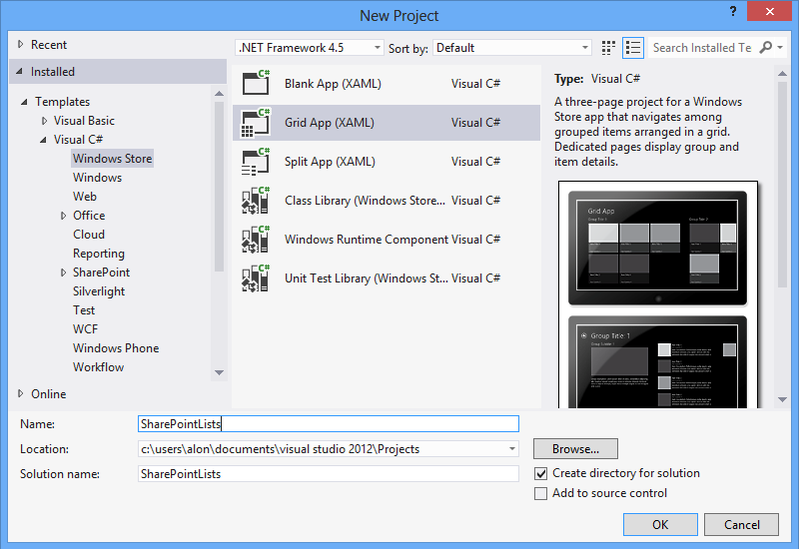 Launch Visual Studio 2012 and select File > New Project. Create a new Visual C# project using the Grid Application template. Add a Service Reference. In Solution Explorer, right-click the name of the project and then click Add Service Reference. In the Address box, type the URL to the target site and append /_vti_bin/ListData.svc. Change the default name in the Namespace box from ServiceReference1 to something more appropriate, such as SharePointService. Click OK to create proxy classes, including a data context and entity classes for the lists that you want to access. Add the following variable declarations at the top of the class. Download or view the complete SharePointDataSource.cs here and be sure to replace the "Servername", "username", "password" and "domain" with the server and credentials of your server that's running SharePoint. Make sure to replace the DataSource on you project. 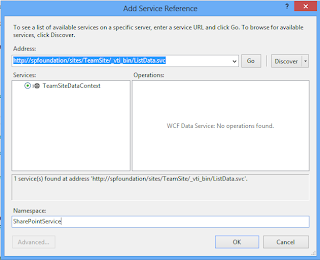 Find all data:SampleDataSource in the xaml files, and replace it with data:SharePointDataSource. And in the xaml.cs files replace all SampleDataSource with SharePointDataSource. But can i let this option work for SharePoint Online? I have tried it but it doesn't work for me. I need sharepoint online as well. I'll try to see how that goes, but if there are additional steps for that, I would greatly appreciate a link to a page with explanation. 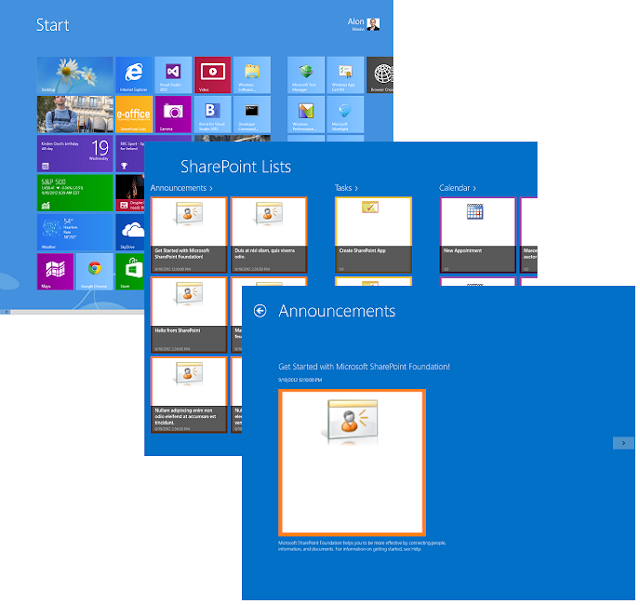 Do you have a sample app to write into a SharePoint list? Just i wanted to know that is it possible to get all document library dynamically. Thanks for sharing, but one question: when I run my App, the app returns no item and so, the grid, is empty. Why? 70% of all DWBI projects today. Informatica is emerging in the market and overcoming all challenges of DWBI compared to any of its competitors. Its time to stop being geek and nerby.. Here is a class which could train yo pragmatically... wat r yo waiting fa!!!! I ever had seen this information over the blog sites; actually I am looking forward for this information. Here I had an opportunity to read, it was crystal clear keep sharing because I have an expectation about your upcoming post. Thanks for sharing this valuable post to my knowledge; SAS has great scope in IT industry. It’s an application suite that can change, manage & retrieve data from the variety of origin & perform statistical analytic on it. Well post, Thanks for sharing this to our vision. In recent day’s customer relationship play vital role to get good platform in business industry, Sales force crm tool helps you to maintain your customer relationship enhancement. Nice article i was really impressed by seeing this article, it was very interesting and it is very useful for me.I get a lot of great information from this blog. Thank you for your sharing this informative blog. It was really a wonderful article and I was really impressed by reading this blog. We are giving all software and Database Course Online Training. Oracle Training in Chennai is one of the reputed Training institute in Chennai. They give professional and real time training for all students. GREENS TECHNOLOGIES, ONE OF THE BEST IT INSTITUTES FOR ORACLE SQL TRAINING IN CHENNAI OFFERS TRAINING WITH PRACTICAL GUIDANCE. OUR TRAINING ACADEMY IS FULLY EQUIPPED WITH SUPERIOR INFRASTRUCTURE AND LAB FACILITIES. WE ARE PROVIDING THE BEST ORACLE PLSQL TRAINING IN CHENNAI. i wondered keep share this sites . thanks for sharing the useful article which is helpful for many people……. Thanks for sharing this prettiest post, I hope you keep your blog as updated. That the interesting one article this one and more useful on carrier,thus the very excellent and more intelligent,the system all articles was very easy and easily understand. This is very informative post. I really enjoy it and this is a great artical.I hope I will use this for our next business website. I like this article which is informative and it is useful , it tells about the windows 8 os and now i know how to use it and its concepts and thanks for sharing. It is really nice and awesome thanks for sharing this concept and also i like to share information about sap fico training in chennai with experienced staffs and practically oriented classes. I tells about the concept of share point accessing in windows 8 app it is new to me and i learned a new thing today thanks for sharing. Wonderful article with useful and clear explanation. I really enjoyed by reading your blog post. Thanks a lot for sharing this amazing content with us. thanku For sharing about C#..
Thanku for sharing thias excelelnt posts..
Nice article and great knowledge. Thanks for the share. I love this story and enjoy with your words.Please share walk-ins in hyderabad for etl testing fresher’s. Nice blog and useful information about the SQL the Structured language used for the data accessing from different data base. CCNA jobs in Hyderabad | CCNA Openings in Hyderabad . Before choosing best Job Oriented courses it is important to evaluate your skills, interests, strength and weakness. Short Term Job Oriented Courses enable you to get a identity once you finish the same. Choose eNvent software Technology that suits you and make your career worthwhile. This article is for everyone. Thanks for the way to handle it on Windows. It solves the problem. It’s always good to learn tips like you share for blog posting. I just started posting comments for blog and facing problem of lots of rejections. I think your suggestion would be helpful for me. I will let you know if its work for me too. Thanks and keep post such a informative blogs. Thanks for the tips and advice. This is the first visit to your blog. Your post has an effective read, thanks. I agree with many people who comment. Hello!! I went to the site for the first time. I strongly advice . Very Nice Blog.......With Unique Content....got the best answers for my question's..
CIITN is one of the most credible Oracle DBA training institutes in Noida offering hands on practical knowledge and full job assistance with basic as well as advanced level Oracle DBA training courses. At CIITN Oracle DBA training in noida is conducted by subject specialist corporate professionals with 7+ years. CIITN Noida provides Best Big Data Training in Noida based on current industry standards that helps attendees to secure placements in their dream jobs at MNCs. CIITN Provides Best Big Data Training in Noida. CIITN is one of the most credible Big Data training institutes in Noida offering hands on practical knowledge and full job assistance with basic as well as advanced level Big Data training courses. At CIITN Big Data training in noida is conducted by subject specialist corporate professionals with 7+ years of experience in managing real-time Big Data projects. CIITN implements a blend of academic learning and practical sessions to give the student optimum exposure that aids in the transformation of naïve students into thorough professionals that are easily recruited within the industry. CIITN is the best Hadoop training center in Noida with a very high level infrastructure and laboratory facility. The most attractive thing is that candidates can opt multiple Institute.